ST. GEORGE – While an initiative to put the question of medical marijuana legalization on the 2018 ballot moves forward, Utah lawmakers are also working on marijuana policy bills for the upcoming legislative session. Among the legislators proposing marijuana-related bills is Sen. Evan Vickers, R-Cedar City. 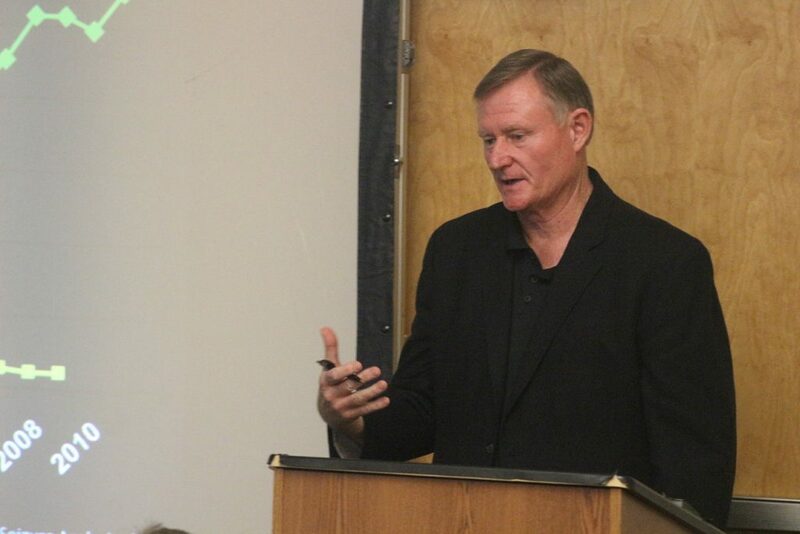 While visiting St. George Wednesday for a presentation regarding the impacts of marijuana use and the ballot initiative, Vickers spoke to St. George News about his bill, which has two parts. One part involves regulating hemp-derived cannabidiol, or CBD oil, currently being sold on store shelves, while the other part addresses how patients can access medical marijuana. CBD is a chemical derived from the marijuana plant, and unlike THC it does not contain a psychoactive component. THC is the part that produces a “high,” or measure of impairment in users, while CBD is touted for its plethora of medical benefits, such as helping to reduce seizures in people with epilepsy. CBD-based oils were legalized in Utah through 2014 legislation allowing use for children and adults with epilepsy. Vickers said he was surprised when he started seeing CDB oil being sold in drug stores, supermarkets, smoke shops and other businesses. A problem that arose in Utah last year with store-bought CBD involved people falling ill after taking it due to substances labeled CBD actually being something else. The instances Vickers referred to were confirmed by Barbara Crouch, executive director of the Utah Poison Control Center. Instead of CBD oil, the samples the center tested were found to contain a synthetic-THC, more popularly known as “spice.” In addition to physical symptoms, Crouch said, the spice compound also triggered hallucinations for some. These incidents primarily occurred in northern Utah between November and December, she said. This has prompted Vickers to draft legislation that would allow the state to test the CBD oils in order to confirm they are what they claim to be. “It doesn’t make it legal, technically, but it protects the public,” Vickers said. The second component of Vickers’ bill addresses how patients will be able to access medical marijuana. The bill would establish guidelines related to marijuana dosing for prescriptions, something the state currently lacks. The bill would also have the state asking the DEA for a waiver allowing Utah to control the growth and production of marijuana into a medicinal dosage form. The product itself would be allowed for sale through pharmacies that obtain the proper state licensing. Vickers, a pharmacist himself, said his own pharmacies would not sell the product if the bill were passed. He cited a potential conflict of interest due to being the bill’s author. Rep. Brad Daw, R-Orem, is also working on a trio of marijuana-related bills. One bill would allow hemp, a low-THC strain of marijuana, to be grown for commercial applications. Another bill would give terminal patients the “right to try” medical marijuana-derived medicines. A third bill would allow the state to grow marijuana for research purposes. The 2018 legislative session starts Monday and runs through March 8. Let’s Propose “Decriminalize It”, it’s a God Given Plant for hells sake! And it’s everywhere anytime , available for Madicinal Use I’m Any Town In The Country ! The research has been Done! We aren’t paying you Pencil Heads to Think! Do what We The People Say or your Elected Out! Period! You Ploititins are So Out Of Touch On This . Free The Plant!! Yes it’s a Frikin PLANT!!!!!!! This law is nuttier than the fruitcake i just threw out. Other than samples, doctors do not dispense medication. Plus, cannabis is a Schedule 1 substance, so any doctor dispensing it is in violation of the very law that gives them permission to dispense in the first place. And Vickers wants to test a substance still illegal under Utah law. Derp. Want to know how to resolve the whole purity issue? LEGALIZE it all. No one will be buying tainted crap from some black market vendor when they can get decent, real cannabis from a dispensary. The oil we buy for our child in Colorado is lab tested for purity and cleanliness. Don’t believe me about people going to a dispensary? Drive to Mesquite. Out of 44 cars in the parking lot last weekend, 41 had Utah plates. People already trust legal dispensaries more than their old Hurricane dealer. And if you go down the road to Lee’s Discount Liquor you’ll find a lot of those same vehicles. Sorta like one-stop-shopping. Whether it’s medical use or recreational use, cannabis appears to be having an impact on the rates of opioid abuse. I can’t believe we pay lawmakers to do this. Here’s a tip, Mr. Vickers – no one is interested in your opinion about marijuana. The people know everything they need to know about marijuana – enough to realize that government criminalization of it is a scam. Legalize it and stop wasting people’s time, ruining lives, and virtue-signaling to the “religious fanatic” voting bloc.